'Nancy Butterfly' ( Harry Hite, R. 1975). Seedling #MC-108-3. MDB, 5" (13 cm). Early bloom. 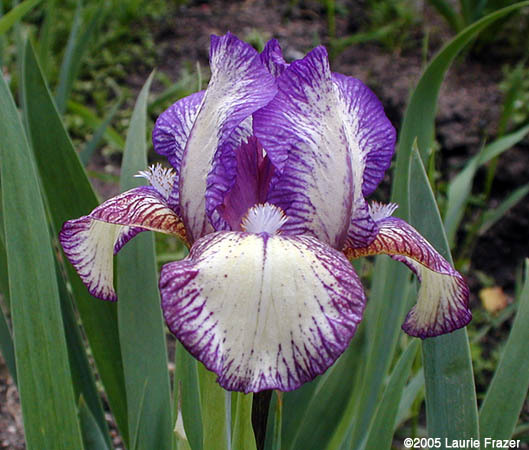 Deep rich violet markings on cream ground. ( 'Lilli-Bitone' X 'Dale Dennis') X Welch seedling #H-521. Hite 1976. JPG nancybutterfly01.JPG manage 74 K 27 Nov 2014 - 16:35 Main.TLaurin Photo by Don McQueen,London, Ont. Canada Zone5. JPG nancybutterfly02.JPG manage 81 K 19 Jul 2014 - 16:46 Main.TLaurin Photo by Don McQueen,London, Ont. Canada Zone5. JPG nancybutterfly03.JPG manage 79 K 27 Nov 2014 - 16:37 Main.TLaurin Photo by Don McQueen,London, Ont. Canada Zone5. JPG nancybutterfly04.JPG manage 70 K 27 Nov 2014 - 16:39 Main.TLaurin Photo by Don McQueen,London, Ont. Canada Zone5. JPG nancybutterfly05.JPG manage 91 K 04 Jul 2015 - 19:59 Main.TLaurin Photo by Don McQueen,London, Ont. Canada Zone5. JPG nancybutterfly2.JPG manage 922 K 03 Jul 2016 - 20:12 Main.TLaurin Photo by Don McQueen,London, Ont. Canada Zone5.